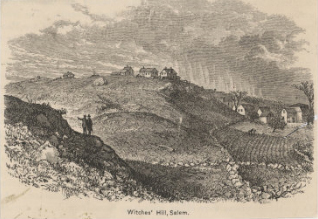 The story of 18 people accused as witches in the 1692 Salem Witch Hysteria ends as victims at the end of a hangman’s rope on Gallows Hill, otherwise known as Witch Hill or Witchcraft Hill. You would think such a public and awful event at that spot would have made such a huge impression on people that the location would live forever if only in infamy. Yet today, the exact location of the hangings, and even which hill is Gallows Hill, is not precisely known. 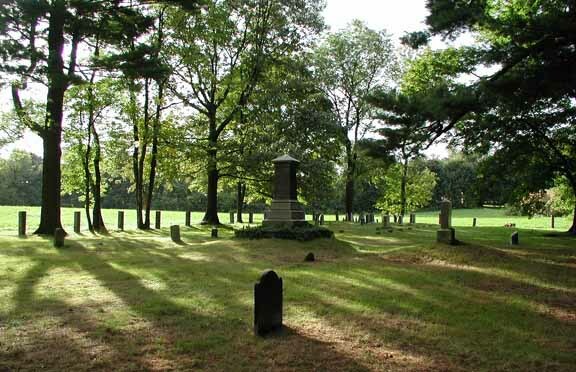 The town of Salem did set aside a public park but there is still historical debate about the location of the site and the clues lead elsewhere. Let us see where those clues lead. Many years ago as a young man I traveled the country for a year. With me I brought a number of books to keep me occupied, and included were several volumes on the Salem Witch Hysteria. These were fascinating accounts of the bitter land-feuds and ministerial issues that polarized Salem Village. This was to erupt in 1692, with a supernatural twist, into a seething cauldron of persecutions, accusations, and executions. 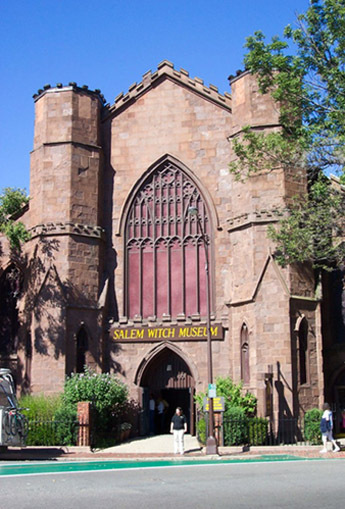 The entire drama captured my imagination and upon returning to New England, I visited Salem to see the locations of the many events. 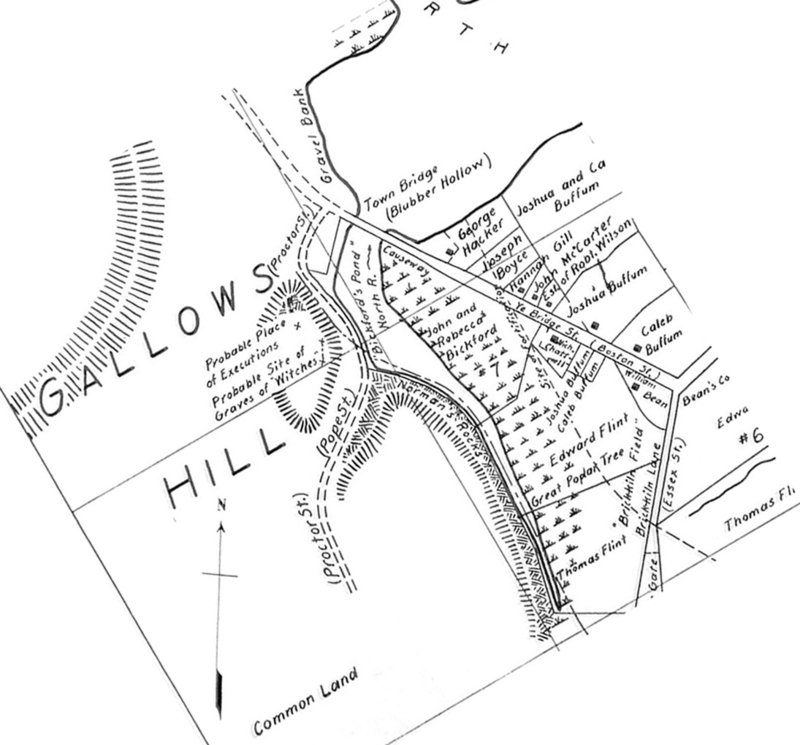 High on my list was Gallows Hill. Little did I realize it would be 20 years or more before I stood on the actual place where the hangings occurred. 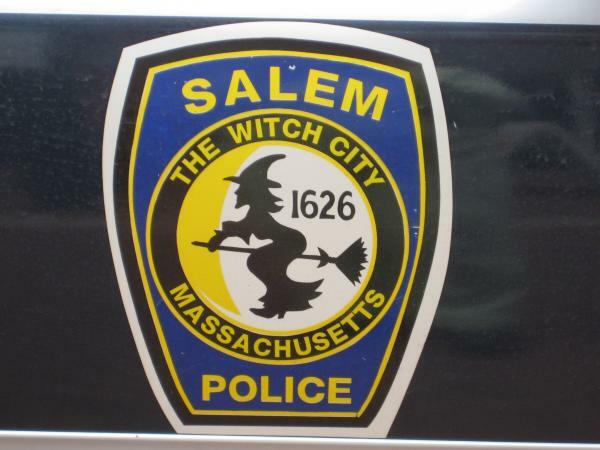 Although I grew up in Middlesex County, I had never been to Salem in adjoining Essex County until I went on my pilgrimage there. Driving in on Lowell Street from Peabody Center, I crossed into Salem at the Old South Cemetery. Here a sign at the town line informed that I had entered The Witch City. What were they trying to say by that, I wondered? By the time I got to Salem Common and had a walk around, I knew. 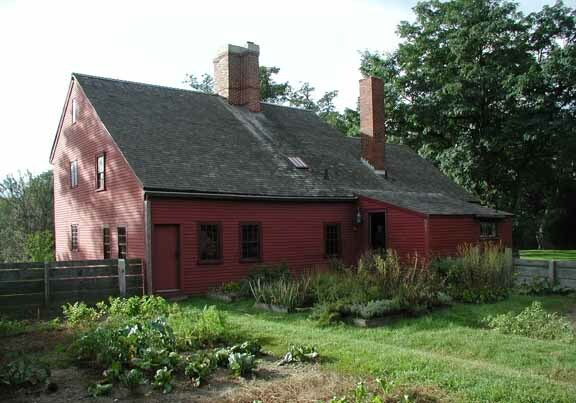 Salem had made a tourist trade off the Hysteria, even though virtually all the characters and action in 1692 took place in Salem Village, which was renamed Danvers about 50 years after the hangings. Salem Common was a dangerous place. It was where everyone walked their dogs, and back then there was no such thing as “scooping.” I quickly renamed the place Dog Poop Park, a name that has stuck long after the town bylaws have changed to address that situation. There was a terribly tacky Witch Museum in a wonderfully old gothic building. I walked in and promptly walked out. Around the corner was Laurie Cabot’s Crow Haven Corner. In case you don’t know, Laurie Cabot is Salem’s official Witch. It was an interesting little shop in a spooky old Colonial house. The ambiance alone was worth every penny of the herbs I bought to be polite. 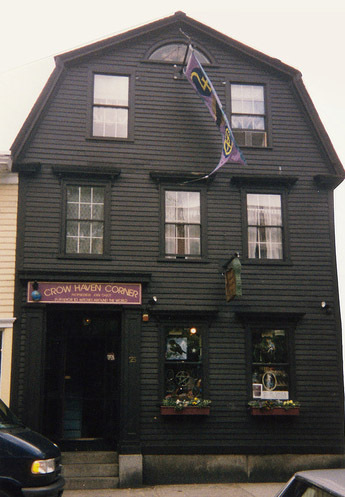 The Salem Common and Pickering Wharf area were a co-mingling of historical Witch Hysteria sites, and modern Witch and New Age shops. 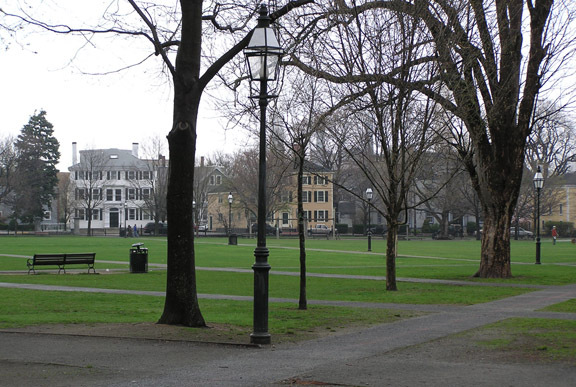 As delightfully “witchy” as the Salem Common area turned out to be, I directed my steps to Gallows Hill. The directions I had led me to a park near Proctor Street, near the intersection of Boston and Bridge Streets. 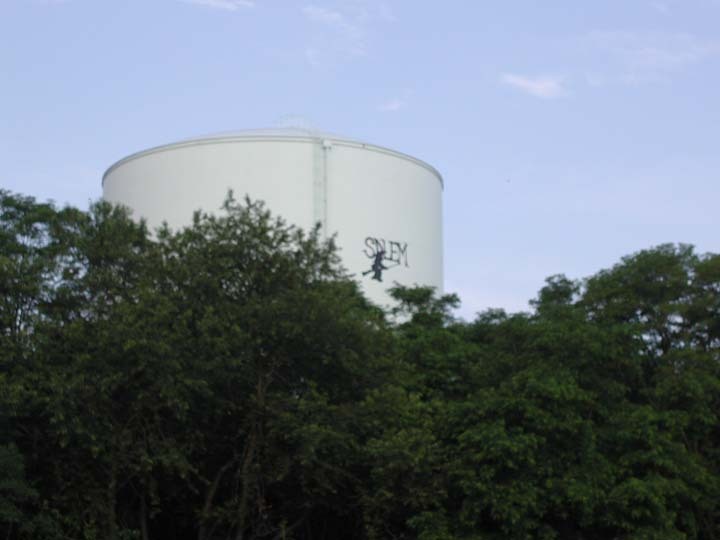 The park was named Gallows Hill Park and a nearby water-tower had a large official witch riding a broomstick painted on the side. This must be the place. I walked up the hill to the official “hanging spot” and looked around. The view was magnificent. But although it was an impressive location, and even a satisfying one, it simply did not line up with the facts I had learned from my reading. For one thing, the hill was steep, and the thought of the accused being transported to the top in a cart, as it is known they were, seemed ludicrous upon having ascended the hill myself. Also, I had learned that Benjamin Nurse had rowed a boat from a creek near the Nurse Homestead, out into the North River, and then to the base of Gallows Hill to recover his mother’s body. It only took one look to see that there was no waterway contingent to the North River at the base of the hill I was standing on. There was no water at or even near the base of the hill The closest water was a canal over a quarter mile northeast. This left me confused. In my opinion, the hill simply did not square with the historical record. I left feeling misled and puzzled over it occasionally in the ensuing years, but with no better understanding. Twenty years later I bought Salvatore Trento’s Field Guide to the Mysterious Places of Eastern North America and was intrigued about this once again. Trento asserted that the official Gallows Hill was not the correct location, much as I had suspected. 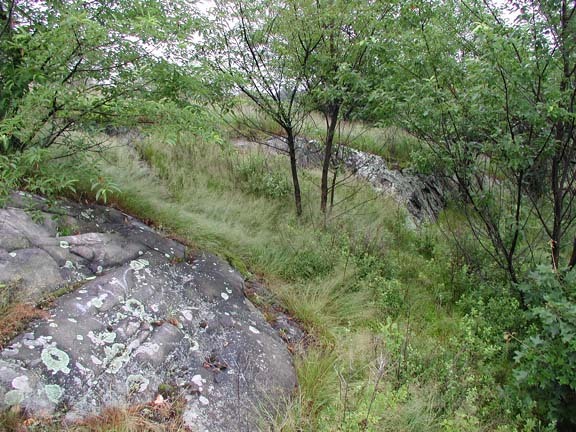 He proposed a nearby hill as the site, complete with crevasse and gallows footing stones. So off I went in July of 2003 to locate this hill. I found it easily enough south of the playing fields in Gallows Hill Park, and about 200 yards Southwest of the water tank. It is a low grassy hill sloping down on its southern end. 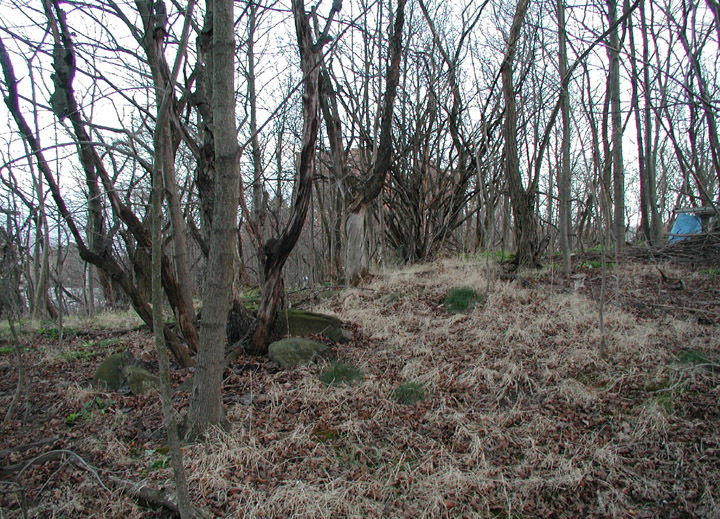 The north end was a knoll with a crevasse just over the side (history tells us the bodies were dumped in such places). The hill even had easy cart access up the south side from Colby Street, which looked liked it may have been a road back in the hanging times. I was pleased with this discovery, but the fact that this hill was even farther away from the closest waterway to North River was disconcerting. It was over a half mile to the canal in fact. I wondered how Trento reconciled this fact with the site’s location. So I went back to the books and refreshed my grasp of the known facts. Several things immediately invalidated the Trento site. First, he says the footing stones for the gallows are still visible. 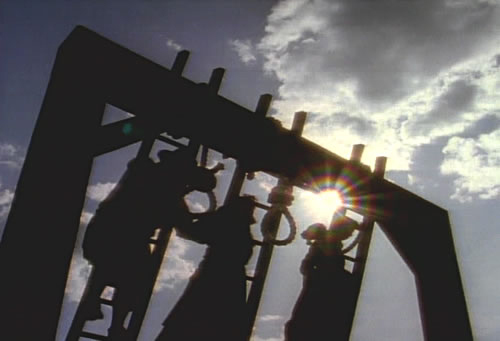 I have seen the stones he talks about, but the problem is that the accused were not hung on a gallows. Rather, they were hung from the branches of trees. Researchers have combed the meticulous records of the trial era, and not one mention was found of a gallows, and more tellingly, there is no record of the cost to purchase wood and construct such a gallows. Also, the accused were brought to the top of the hill in a cart. Although that is quite doable at the Trento site, the approach is from the Colby Street area, and it is known that the actual route went over Town Bridge at what is now the intersection of Boston Street and Bridge Street, and thence up the hill. The Trento site does not fit with this fact either. Disappointed, I determined to find out once and for all the actual location. By the time of Upham’s writing, the actual site, wherever it was, had dropped from public consciousness. The entire hanging episode was an acute embarrassment and shame to the community, and although the site was known to people, it was not publicly proclaimed or celebrated. Rather, the subject, and therefore the location, was avoided and a kind of collective amnesia occurred in regards to the location. People simply wanted to forget, and thus the location was “forgotten” too. 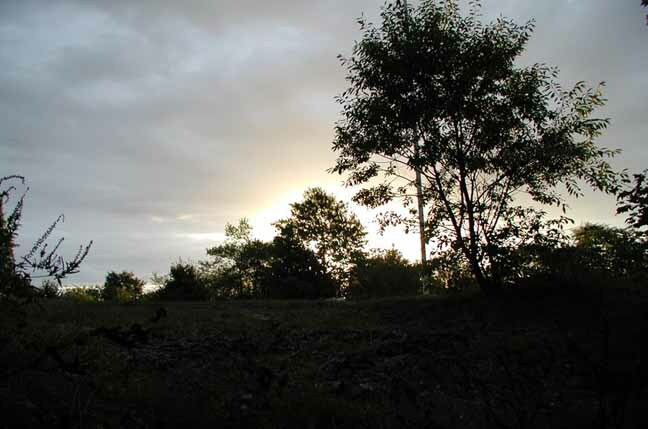 However, it doesn’t help the tourist trade in modern Witch City to not have a true location of Gallows Hill. Let the scholars argue as they will, but the hill that Upham chose has become the agreed-upon location for pragmatic ends, if nothing else. Fortunately, there are a number of scholars and researchers who have made a thorough examination of the facts and have come to conclusions more consistent with the historical record. Perley did discover a number of important clues. He was able to reconstruct the landscape and land ownership of Salem at the time of the hangings, making a number of maps. A final and composite map of Salem circa 1700 drawn from his work was assembled by William Freeman and published in 1933. 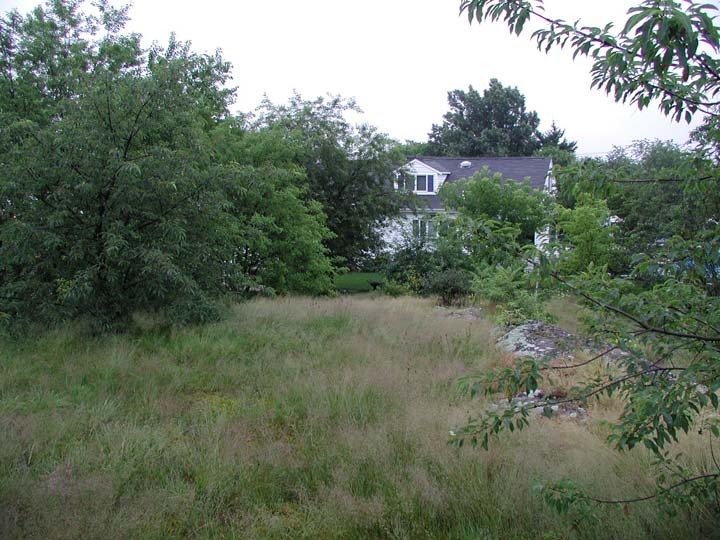 Perley was able to locate the house Symonds was born in and found that it was impossible to see the supposed hanging site on the southern end of the hill, let alone Gallows Hill. Ledge Hill completely blocks the view. However, a nearer lower hill that better fits the facts of the circumstance was well in view. The known route from Salem to the hanging site is from Prison Lane (now St. Peter Street), then the long ride down Essex Street, thence a short ride on Bridge Street (now Boston Street), and over Town Bridge and then left to the hill. Town Bridge (now the Junction of Boston and Bridge Streets) was the recognized limit of the town in 1692. The Sheriff of Salem, George Corwin, was given the authority to choose the execution location, the only stipulation being that it be done outside of town. Immediately upon crossing Town Bridge, the lands to the left (including the official Gallows Hill) were all Common Lands. Salem was built on a peninsula of land. The only road out of town at the time was over Town Bridge. Thus Corwin would have taken the condemned at least over Town Bridge. Perley believes that Corwin did so, but no further. 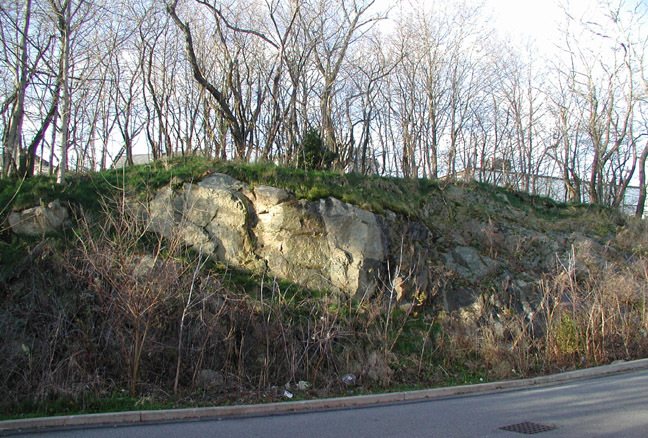 Perley believes that Corwin took the immediate left after the bridge onto Proctor Street, at that time only a cart road skirting a low hill, and deposited the condemned at this little hill for execution. This site fits all the known facts. First, it is over the town line. Second, it is easily accessible by cart. Third, the hill was of sufficient height that Salem was observable from it, a noted fact. 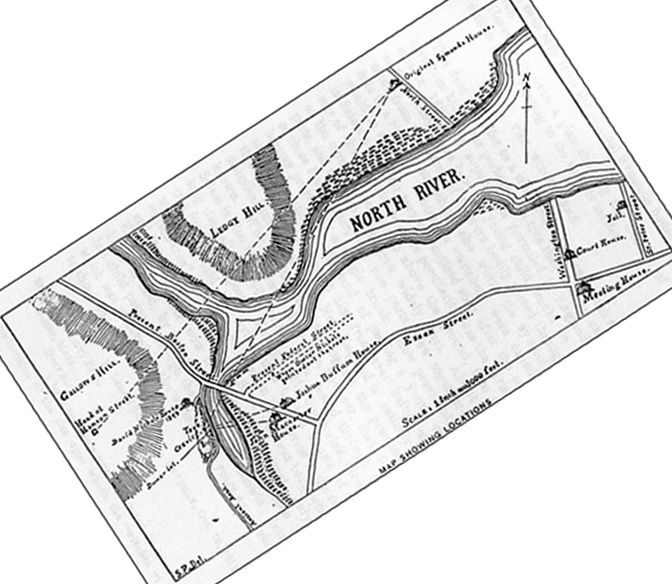 Forth, at the time, the North River extended in a large bay all the way to Town Bridge. The modern canal is simply all that is left of the bay after it was filled in. In 1692 the Town Bridge crossed a small arm of the North River bay called Bickford’s Pond. Bickford’s Pond abutted the small hill. This fits with the story that Benjamin Nurse was able to row his boat all the way to the base of the hill. 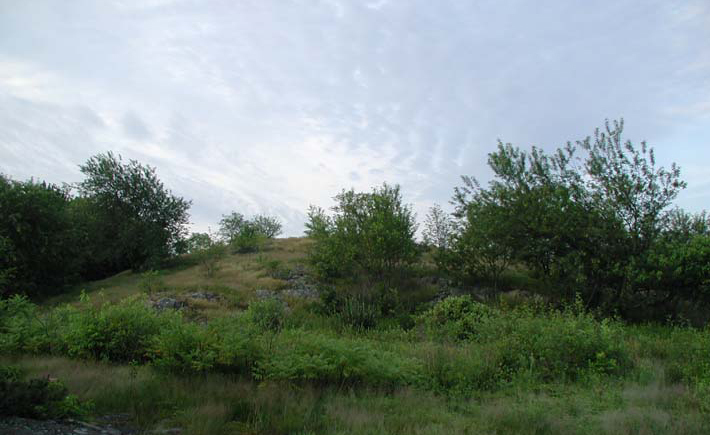 Fifth, the small hill supported substantial trees, whereas Upham reports of the official Gallows Hill site that the “scattered patches of soil are too thin to tempt cultivation.” Thus no trees, and recall that there is no evidence of an actual gallows erected – so how were they hung, then? Sixth, the hill may be plainly seen from John Symonds’s birthplace, exactly as his nurse said. 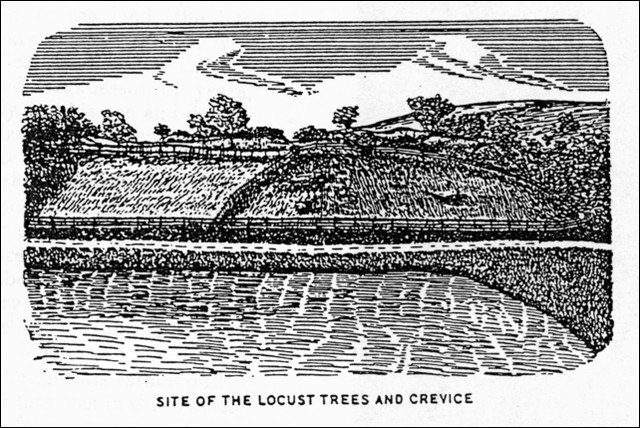 Adams was incorrect about them being a memorial, however the clue of the locust trees led Perley to inquire of the owner of the small hill if locust trees had ever grown there. Indeed they had, although recently cut down. 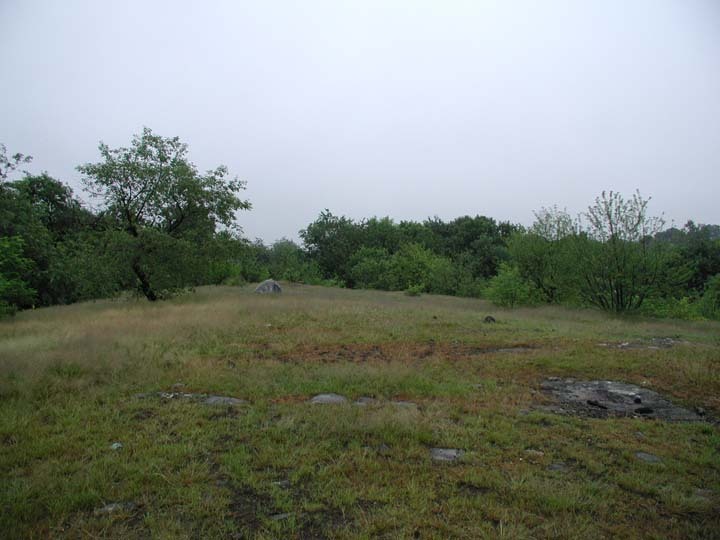 No locust trees or memory of locust trees were found on Upham’s choice of Gallows Hill. 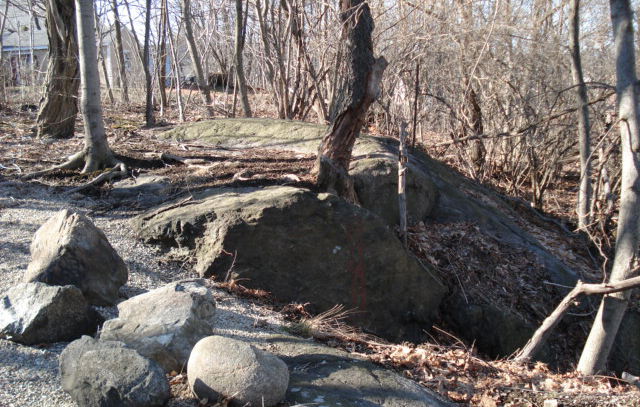 An interesting side note is that there was a so-called “Witch Tree” on the Perley site as late as 1793. This tree was not connected with the hangings, but was rather of an odd shape. It divided a foot or two above the ground into two trunks that then grew wildly apart, only to reunite into a single trunk several feet higher. 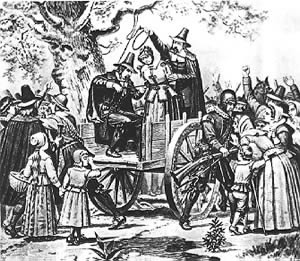 It was the custom among some Salem residents sometime after the hysteria to pass new-born babies through the hole to protect them from witches. 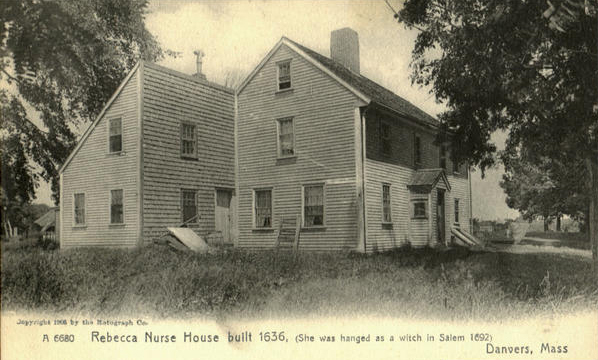 Nurse family tradition is that when Rebecca Nurse was hanged on July 19, 1692, that her youngest son Benjamin, then 26 years old, rowed his boat under cover of darkness from the Nurse homestead to Gallows Hill to retrieve her body. This is not as impossible as it might seem, even though it was a 6 mile one-way trip. For one thing, it was not unusual for Salem Village farmers to row into Salem Town. The route Benjamin would have taken started from Crane Brook on their property, passing east under Hadlock’s Bridge, then further east under the Crane River Bridge on Ipswich Road, and out into the Crane River proper, a tidal bay. He would have continued rowing east to where the Crane River joined the Wooleston River, another tidal bay. 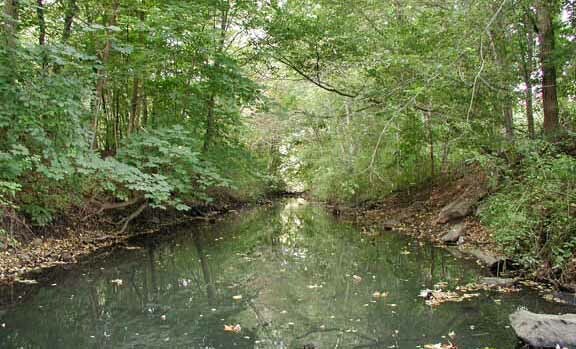 He would have turned South into the North River near Skerry’s Point in Salem Town were they original lived before buying the farm in Salem Village. Down the North River, a tidal bay, he rowed, then under Town Bridge and into Bickford’s Pond. 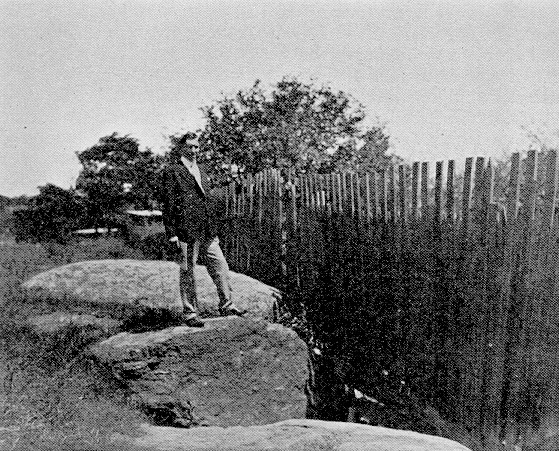 Proctor Street occupied the 20 foot wide flat between the pond and the hanging hill, which rose about 30 feet high. Rebecca’s body was dumped in a crevasse on the face of the hill. He would have retrieved her body from the crevasse and rowed back to the homestead where his older brother Samuel (who had adjoining property) and father Francis buried her in an unmarked grave. I had a feeling years ago that something was not right with the official Gallows Hill location. It didn’t square with the facts as I knew them. The alternative location that Trento proposed had even more historical problems. It wasn’t until I worked on Perley’s material that I felt a proposed location fit the known facts. It’s my opinion that Perley is the only one so far that has produced a location for Gallows Hill that is convincing. Perley’s work seems historical proof enough, certainly more then Upham’s, but it has no official recognition. 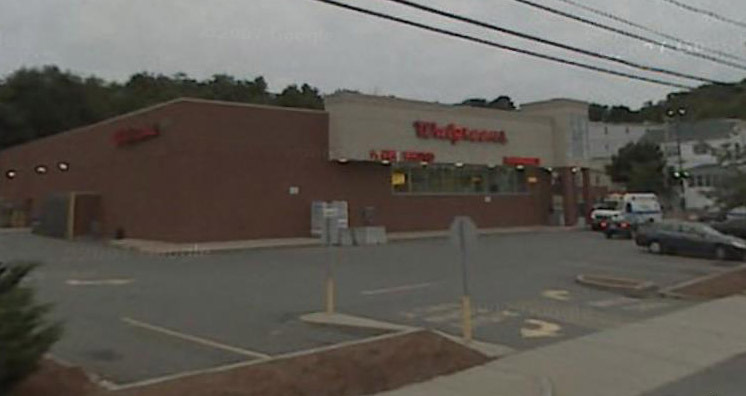 Perhaps because a Walgreens occupies the site and it’s not a very tourist friendly location. On November 19, 2006, I visited the Perley site. It is located at the junction of Boston, Bridge, and Proctor Streets. This intersection was actually Town Bridge three hundred years ago. From here, turn onto Proctor Street. Today Proctor Street curves up behind the hill, but back in 1692 it curved in front of the hill. In any event, the hill is behind the Walgreens and the parking lot butts up against it. Proctor Street used to curve along it face between the hill and the pond. Walgreens is where the pond used to be. The Witch Hill GPS coordinates are: 42.5180N, -70.9100W. 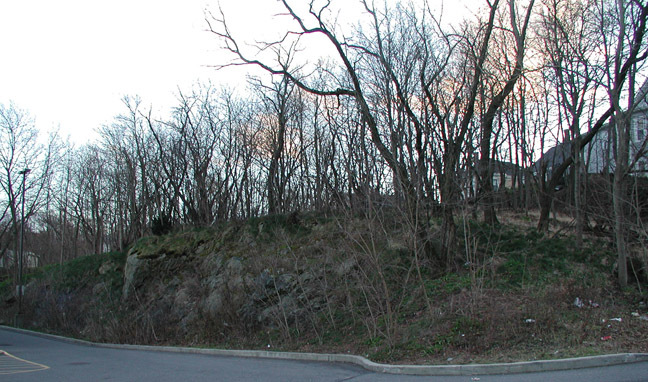 You will notice that the face of the hill behind Walgreens is steep and rocky. This is due to a since-removed railway that was put through along the base of the hill in the 1870’s. Base of hill behind Walgreens where the railroad was. The digging and blasting changed the face of the hill from a smooth grassy slope to the current bedrock and steep ledge. 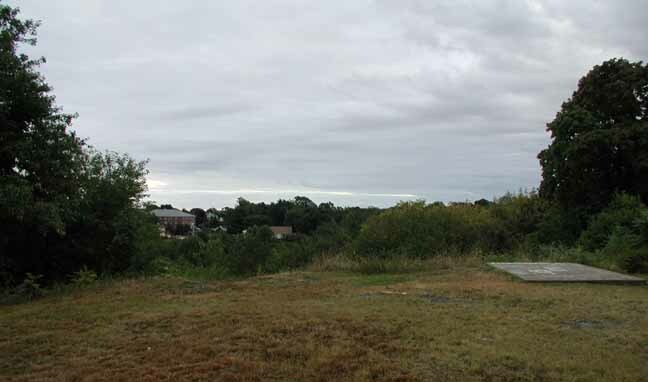 The hangings took place on the flat of the hill directly behind and overlooking the parking lot near the hill’s northeast end. 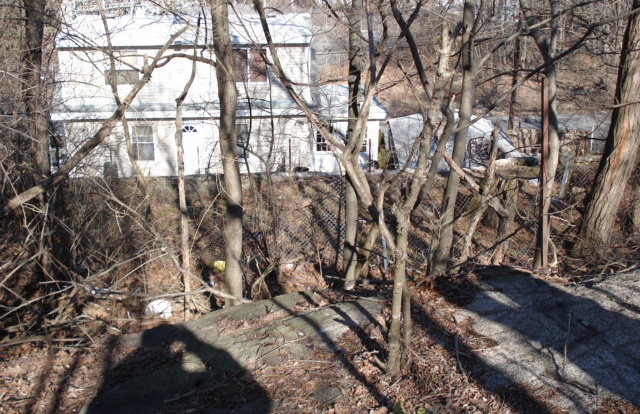 This area is now a small grove of young trees in a Proctor Street resident’s backyards. 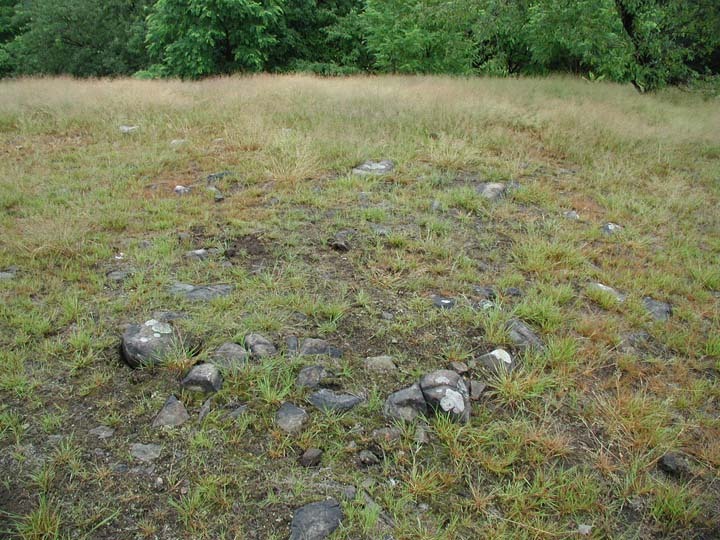 The hangings were on the top of this knoll, in the center of the picture. The crevasse is further down the length of the hill, near where Pope Street turns left past the Walgreens parking lot. The actual location appears to be in someone’s side yard. At first appearance it is not an obviously spectacular or evocative location. But the little tangle of oddly twisted trees at the top is a witch’s woods of sorts. If you visit, say a prayer for the accusers, not the accused, it’s their pain that lingers here.